In 18th Century England, the Vicar of Dymchurch (Patrick McGoohan) takes on the alias of The Scarecrow. Alongside his gang of smugglers, they turn against the King and his high taxes, by smuggling goods across the Romney Marshes. The Scarecrow comes under threat from the Kings army after they learn of his rebel gang, and he becomes a wanted man. Aided by the locals, the Scarecrow must come up with a plan to get rid of the Kings army whilst maintaining his successful smuggling operations that many locals have come to rely on. The film was released as part of the Disney Treasures Collection in 1964. 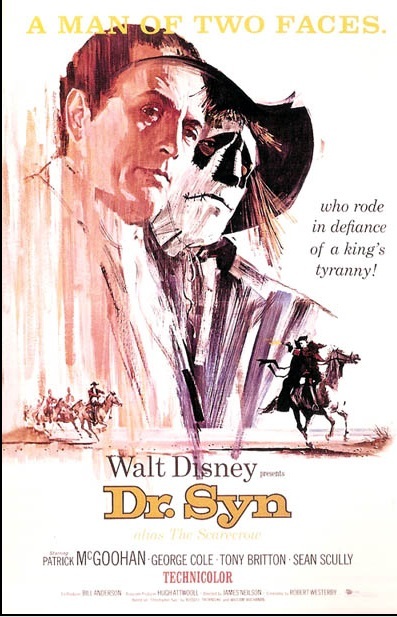 Walt Disney adapted the stories from the original DR Syn books written by Russell Thorndike, and the later book ‘Christopher Syn’ written by William Buchanan. Originally, the production was only intended to be aired in three parts on Disney’s weekly television show Wonderful World of Colour, but was later adapted for release on DVD. The film stars Patrick McGoohan (Treasure Planet, Columbo), George Cole (The Dinner Party, My Good Friend),Michael Hordern (Wind in the Willows, The Secret Garden), Tony Britton (The Way We Live Now, Don’t Tell Father), Sean Scully (Two Door Mansion, Evil Never Dies) and Alan Dobie (The Hospice, Kessler). Romney Marshes were the background to the production and so featured throughout the film and consist of around 100 square miles of coastal marshlands located in South East Kent. It is a popular tourist destination due to its sandy beaches, historic buildings and diverse landscape which is perfect for walkers and cyclists. Romney Marsh has also featured in Parades End (2012), Great Expectations (2012) and The Inspector Lynley Mysteries – Natural Causes (2006). 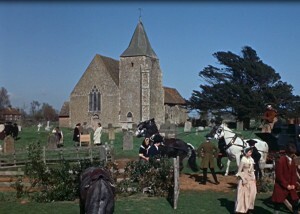 St Clement’s Church in Old Romney doubled as Dr Syn’s Dymchurch parish church in the production. Walt Disney funded the repair of the building in order to use it as a filming location. The interior was painted pink by the crew and remains so to this day. The 3 Part TV series first aired in 1963 and is available to watch on DVD. This entry was posted in Filmed in Kent and tagged Dr Syn: The Scarecrow of Romney Marsh film locations, feature film, Romney Marsh, St Clement's Church Old Romney. Bookmark the permalink.